We are excited to announce that you now have the ability to sync your Elation Schedule with Google Calendar. 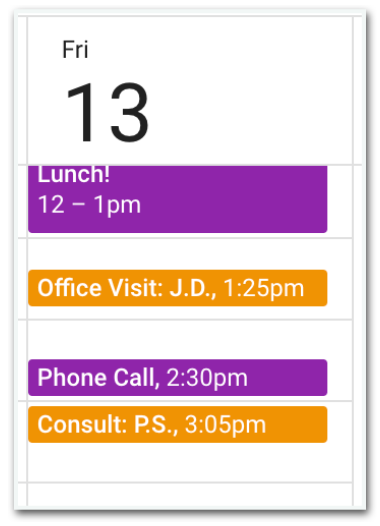 Google Calendar Sync enables you to easily to keep track of patient appointments and personal events in the same place. Utilizing this feature will allow you to see patient appointments on your mobile device, reduce double bookings, and manage your time more effectively. 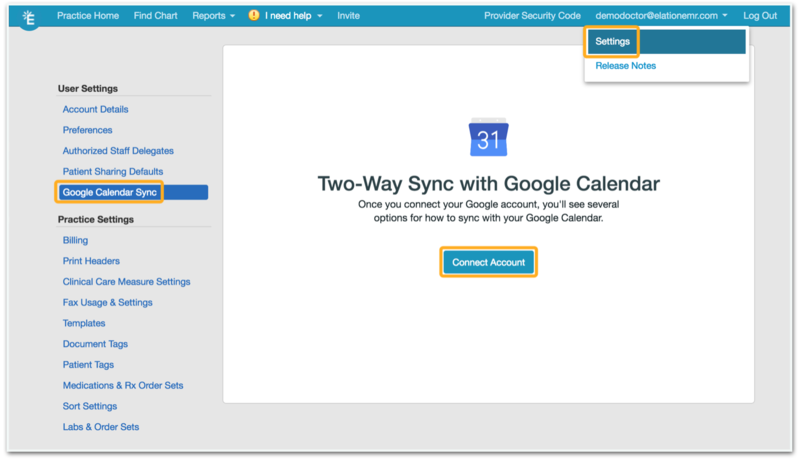 To set up Google Calendar Sync, please follow the step-by-step instructions below. Your sync will start immediately. It typically takes about 15 minutes to sync all events - we sync all events for up to one year in the future. 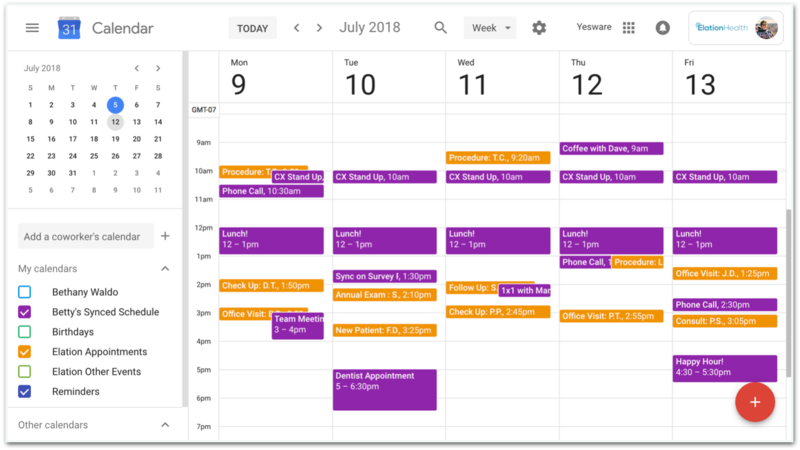 Once set up, all patient appointments will show up on your Google Calendar in a HIPAA compliant way, while personal events populate your Elation schedule at your desired level of privacy. Patient appointments syncing from Elation → Google will show up in Google with the appointment type, and the patient’s first and last initials only, as seen in the screenshot below. For personal events syncing from Google → Elation, the provider will have an option of whether to make their personal information private or public from the Google Calendar Sync settings. If you choose "Hide event details", the event will show up in Elation as a "Google Event", with no description. If you choose "Show all event details", the event will show up in Elation as a "Google Event" with the same event name which shows on your Google Calendar. **Please note: “All-Day” events in your Google Calendar such as vacation time or other all-day/multi-day events will not sync with Elation at this time. If you would like to block off an all-day or multi-day event in Elation, please do so by creating an “Other Event” on your Elation schedule to ensure those days are blocked off entirely. If you decide to delete an Elation calendar from within Google, the sync will be removed and all Elation events which were previously showing up in Google will be deleted from Google. These appointments will remain available in Elation. If you delete a Google calendar which is synced with Elation from within Google, the sync will be removed and all the Google events will be deleted from Elation. The option to select that calendar in Elation will also be removed, as the calendar no longer exists in Google. You can also remove Google calendars from within Elation by visiting the Google Calendar Sync section of your account settings. Once here, simply uncheck the box next to the calendar you would like to remove from your Elation schedule and click Save in the bottom right corner. All appointments/events created in Elation can not be deleted from Elation by editing or removing them in Google - these will need to be deleted from within Elation. The same goes for Google events. 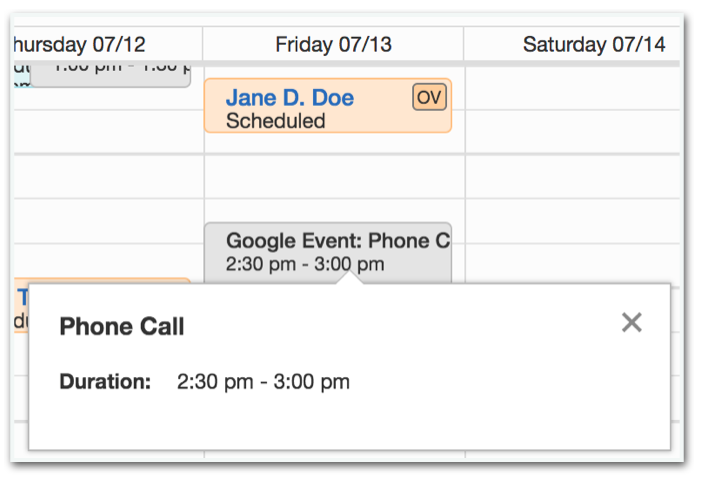 You will not be able to edit or remove appointments which were created in Google from your Elation calendar - this needs to be done from within Google. The original source of the event/appointment creation will be the source of truth for that event. 1. My vacation which is listed in Google is not syncing with Elation. What gives? “All-Day” events in your Google Calendar such as vacation time or other all-day/multi-day events will not sync with Elation at this time. If you would like to block off an all-day or multi-day event in Elation, please do so by creating an “Other Event” on your Elation schedule to ensure those days are blocked off entirely. 2. I would like to delete a google event from Elation, but I’m not able to select “View/Edit Details” on the event in order to remove it. Google events need to be deleted from within Google, so we do not offer the “View/Edit Details” option for those events in Elation. The original source of the event/appointment creation will be the source of truth for that event. 3. Can I Sync my Outlook or Apple calendar? No - the only calendar syncing option available at this time is with Google Calendar.